Our scout troop went and picked apples up in the local mountains last Saturday, where most of the apples are Rome Beauty. 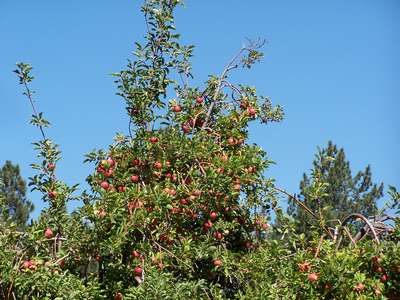 Rome was the most popular variety to plant because it comes into bearing early in its lifetime, bore reliable crops every year, fruits heavily, and the apple is versitle for fresh-eating, cooking, and cider (which is what ours are destined for). Its a very hard apple and only good for fresh-eating for a couple weeks after picking before it turns mealy, but will keep in the crisper bin for months and still makes killer pies and applesauce. Off the tree the taste is sweet, fresh and clean, but not a lot of character. Cooking it really brings out the spicy overtones and changes the nature, and it holds up well in pies and its ultimate use, apple crisp. Speaking of which, my wife cooked some sauce last night and you can smell it from a block away- that heavenly spicy apple scent that reminds you of fall (which is needed around here when the days are still in the 80s). Once you’ve had the real applesauce like this the store-bought Mott’s stuff tastes like paste. Rome Beauty also grows very well down in our hot valleys and is very productive. A few young trees I’ve planted at schools gave them a nice little crop this year. Pick them a little green down here for the best quality, and use it for cooking. Thanks for the post. What do you recommend I cross polinate a Rome with in a Zone 9 planting? Thanks. Rome is pretty self-fertile; if you’re looking for a companion tree, Arkansas Black would be a good one. very happy . that is good. i need some sprouts. These are actually my favorites to eat. They are they only ones beside Courtland and MacIntosh that don’t seem mealy and gross to me by the time they get to the store. THank you so much for your blog and all the info from Kuffle Creek. Me and my two brothers have always been passionate about fruit trees. I live just south of Houston, and plan on planting several varieties of apple in the back yard. We are definately very humid and hot down here, but we also can get cold in the winter (below 30 for a day or so at the most–although this past winter was very cold and we stayed below 30 for almost 4 days at one point). Other than Anna and G. Dorsett (which I planted last year) do you have any suggestions for other varieties that love humid hot conditions? I have noted your page on the varieties growing in the tropics. Also, my main concern would be fireblight, which might not like the our very hot climate but certaily would love the humidity. Thanks for any help you can give. My email is pastor_aaron@epiphanypearland.org. You can see our apple nursery webpage at http://www.kuffelcreek.com/apples.htm Sorry, can’t tell you much about oranges.